British inventor reached a top speed of 32.02 miles per hour. 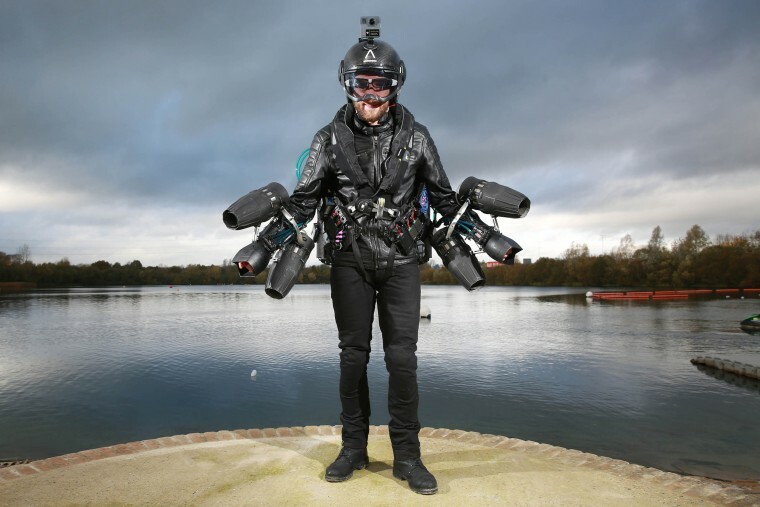 In brief: Gravity's Daedalus jet engine-powered body-controlled suit splashed through a world record, as owner Richard Browning set the fastest flight using what's ostensibly a real-life Iron Man suit. Very soon, the Daedalus could be used commercially. Remember the guy who built a real-life “Iron Man” suit? His name is Richard Browning, and he owns a company called Gravity which is dedicated to developing his invention, the body-controlled jet engine suit named Daedalus. Now, Browning has added a Guinness world record title to this list of accomplishments. Browning successfully flew his Daedalus suit at a record speed of speed of 51.53 km/h (32.02 mph) on his third attempt above the Lagoona Park in Reading, England. Despite mistiming a turn and dropping into the lake a little while later, Browning still managed to set a new world record for fastest speed in a body-controlled jet engine power suit. The Daedalus is a uniquely designed exoskeleton —like Iron Man’s suit only bulkier — equipped with gas turbine engines, four of which are mounted on the arms and another two on each hip. Browning previously said that the suit could eventually go as fast as 321 km/h (200 mph) at several hundreds of meters above the ground. Gravity, Browning’s company, now has hundreds of thousands of pounds in funding for the continuous development of the Daedalus, with a recently completed series of funding adding some $650,000 (£500,000) more, according to the Mirror. All of that funding is necessary, however, as it costs around $250,000 to develop each custom suit. The company is currently working to devise protocols so that the Civil Aviation Authority will allow the Daedalus for commercial use. While the Daedalus might be the first personal jet pack suit to be made available to the public, it’s not the only one of its kind currently being developed. The world’s first true jetpack, called the JB-9, took flight back in 2015. The year after, JB-9’s developer, a company called Jetpack Aviation, entered into talks with the U.S. military to work on further development of the device. More recently, aviation giant Boeing announced that they were sponsoring a two-year long competition to encourage the development of personal vertical take-off and landing (VTOL) gear, which is essentially what an “Iron Man suit” is. All of this work makes it easy to imagine advanced personal modes of flight coming within the next few years. Together with autonomous vehicles and flying cars, this Iron Man suit is helping to shape the future of personal transportation. "A Real-Life "Iron Man" Jet Pack Just Smashed World Speed Records" was originally published on Futurism, LLC on Nov. 9, 2017 by Dom Galeon. Copyright 2017. Futurism, LLC. All rights reserved.